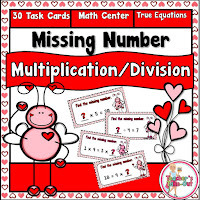 3 Free Math Games for Valentine's Day! All games come in addition or multiplication version. Game 1: Valentine Roll: Played just like the LRC (left, right, center) Game. Roll 2 dice. Either add or multiply and follow the directions on the answer key. Game 2: Cupid's Hearts: Roll 2 dice. Cover the numbers 1-9 on a heart strip. 1st person to cover their entire strip is the winner. Game 3: A Jar of Hearts. 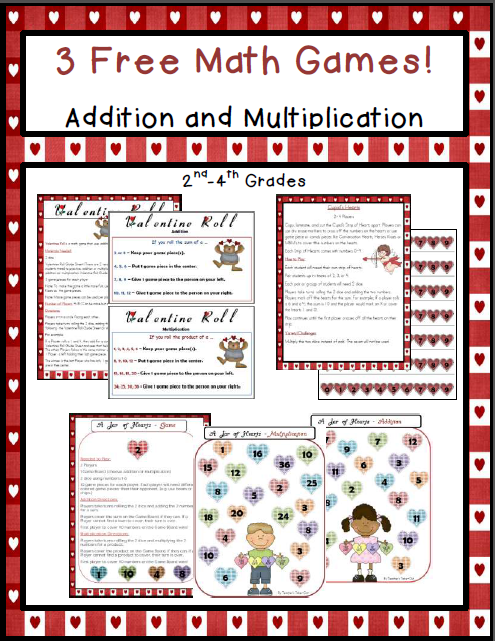 Use either the addition or multiplication version! 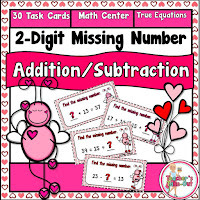 For some fun Valentine Reading and Writing Centers try this little pack. It has 9 fun and engaging centers to keep your students busy for the month of February. All centers are curriculum based. 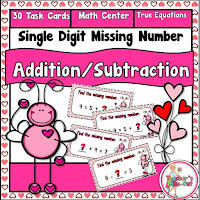 Try these fun and silly Love Bug Missing Numbers. Here is a FREE Letter Writing assignment to get your students writing! Click the picture on the left to download this freebie.